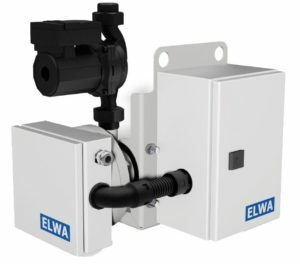 ELWA manufactures continous flow heaters of different designs. We use these heaters in combination with control boxes, pumps and other components to provide ready-to-run units for a wide variety of application. This product portfolio is completed with water supply systems, sludge collecting modules, PTH power-to-heat systems. The series KVD heaters offer highly effective heating power for processes with water or similar media. 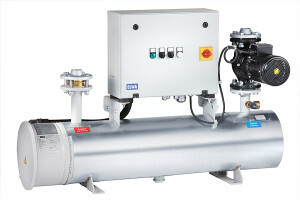 The KVD series is based on high quality shell and tube heat exchangers. 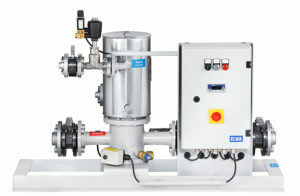 With the mounted control cabinet and the integrated pumps we offer configurable units which can be used for many applications. 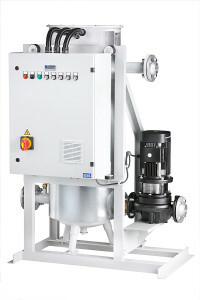 We use high-quality centrifugal pumps. The units can be adapted to any operating voltage between 230 VAC and 690 VAC. 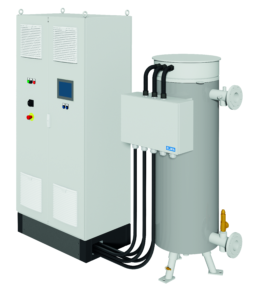 The series KVT heaters offer highly effective heating power for processes with water or similar media. The KVT series is based on high quality shell and tube heat exchangers. With the mounted control cabinet and the integrated pumps we offer configurable units which can be used for many applications. We use high-quality centrifugal pumps. The units can be adapted to any operating voltage between 230 VAC and 690 VAC. The ultracompact KVEc heaters offer highly effective heating power for processes with water or similar media. Due to the flexible design, the units can be adapted to any operating voltage between 230 VAC and 690 VAC.